Home » Eat Well • Health A-Z » 4 Nuts That Will Keep Your Heart Healthy! 4 Nuts That Will Keep Your Heart Healthy! We all have a habit of snacking during the day, either it is due to hunger or out of the urge to eat something crunchy. If you observe what you munch on, you will find that most of the times it is chips, cookies, popcorn or some other unhealthy snack. How good would it be if this snacking could be made healthier and beneficial? Snacking on nuts could serve as an immediate rescue for this. Eating nuts are of great benefit for your heart’s health. They are easy to store, pack, carry, eat and are easy on our pocket too. Be it walnuts, almonds, hazelnuts or any other nuts, almost every type of nut has plenty of nutrition packed in it. 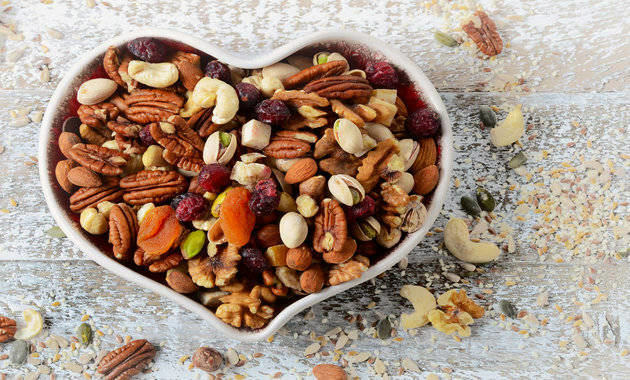 How Does Eating Nuts Help Your Heart? Eating nuts can help in lowering the low-density lipoproteins (LDL) or bad cholesterol levels in your blood. Elevated levels of LDL are one of the major causes of heart-related diseases. Nuts help in reducing the risk of developing blood clots leading to a fatal heart attack. Additionally, nuts also help in improving the health of your arteries. The unsaturated fats, like MUFA (monounsaturated) and PUFA (polyunsaturated) fats, found in abundance in nuts help in lowering bad cholesterol. Most nuts are rich in essential fatty acids. Research shows that omega-3 fatty acids lower the risk of arrhythmias (abnormal heartbeats) that can cause sudden death. In addition, they also decrease the triglyceride levels, slows the growth rate of cholesterol plaque in blood vessels and lowers the blood pressure (slightly). Fish is a good source of omega-3 fatty acids, but nuts are the best vegetarian source of this essential nutrient. Always Trust For Better Heart Care. Browse Our Store Now. Nuts are packed with necessary dietary fibre that assists in lowering your cholesterol levels. It makes you feel full and you eat less food and consume fewer calories. Fibre also helps in preventing diabetes, which is another chronic disease affecting your heart health. Nuts, especially almonds, contain huge amounts of Vitamin E which help in curbing the formation of plaques in the arteries. These plaques narrow the arteries and hamper the blood flow to heart muscles, leading to chest pain (angina), coronary artery diseases or even heart attack. Few nuts contain plant sterols that help in lowering your cholesterol levels. It is even considered as an adjunct therapy in those patients whose cholesterol levels cannot be lowered by using conventional medicines. Nuts are a good source of l-arginine, an amino acid that helps in improving the health of your arteries by increasing their flexibility and improving the blood flow. This helps in lowering the blood pressure. This gem of a nut contains lesser calorie by weight in comparison to its peers. It helps in lowering LDL cholesterol that accumulates as plaque in the arteries and increases the probability of heart attacks. Regular intake of 4-5 almonds on an empty stomach in the morning can help you with your efforts to lose weight. The magnesium, selenium and calcium content of almonds improve bone strength besides deterring cancer, controlling blood pressure and diabetes. Pistachios are known to lower the harmful LDL cholesterol and enhance the HDL or good cholesterol levels in our blood. The anti-oxidants present in the pistachios reverse the damage to our arteries and prevents accumulation of plaque in them, thereby preventing heart diseases. The nuts being rich in Vitamins like A, C, E, K, B-Complex Vitamins like beta-carotene, zeaxanthin, riboflavin, folate and niacin reverses cell damage and delays ageing of our bodily organs. Snack on 4-5 pistachios in between meals. The humble peanut, though is not really a nut, is one of the most beneficial foods when it comes to improving heart health. It functions in the same way as almonds or pistachios and prevents blockage of arteries leading to a lessened risk of heart diseases. Diabetes control is another way in which peanuts can be very beneficial for our cardiovascular system as a whole. Have a handful (8-10) of peanuts 3-4 times every week. Weight Loss Is 99% Mental And 1% Physical. Start Your Journey Today. Click Here. This alien-like looking nut is packed with polyunsaturated or good fats that contribute to its rich taste and creamy texture. The alpha-linoleic acid contained in walnuts is anti-inflammatory in nature. These polyunsaturated fats and alpha-linoleic acid together help in removing plaque from the arteries thereby reducing the chances of stroke. Walnuts are very good for the brain and the nervous system as well. Have one walnut kernel every day of the week. Clearly, the benefits of nuts for your heart are tremendous. Although nuts are rich in good fats, they are also rich in calories. Hence, these should be eaten only in moderate quantities. Substitute unhealthy mid-meal snacks like vada pav, samosa, with a handful of nuts. According to the American Heart Association, eating four servings of unsalted nuts a week is healthy for your heart. Stay Healthy, Stay Happy! ← What Are Some Effective Ways To Increase Height Naturally?